Welcome to the scary world of the ASCII games. This my very first finished game. Released on April 2011. I was a very big fan of roguelikes at that time and I wanted to write my own. I discoveredlibtcod and started working on it. It was a great experience because learned Python (at that time I only knew C from my university) while making the game. 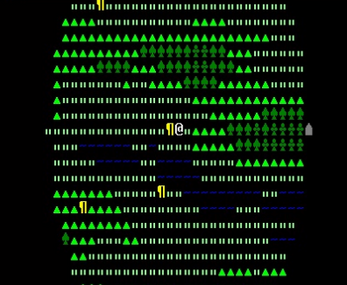 Since the game has ASCII graphics, a roguelike is a very good game for a 1-man dev team. PabloQuest does not only feature dungeons, it has towns. The player can buy and sell goods, rest and hire companions. If the player character is powerful enough, he can try to raid the towns. When the player leaves a town, he enters the wilderness. The wilderness consist on seas, beaches, plains, forests and mountains. 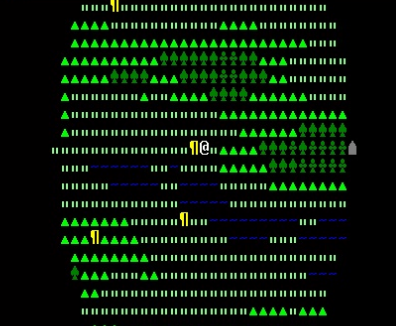 The wilderness (like everything else in the game) is randomly generated for each game. A customized heightmap generator is used and the game will place 5 dungeons and 5 citys (of diferent sizes and difficulties) in a random locations. The player must adventure himself and conquer the 5 dungeons in order to beat the game. PabloQuest also features dismemberment, a dodging system, boss battles (one per dungeon) and random treasure rooms. My game inspired another game developer (Tomasz 'Vedor' Nowakowski ) and he createdUnPabloQuest, a fork of the original game.